Upgrading Seagull License Server to a new version requires installing the new version and activating it with the upgraded product key code. If you don't know where your current Seagull License Server is located, then your first step is to find where Seagull License Server is installed on your network. 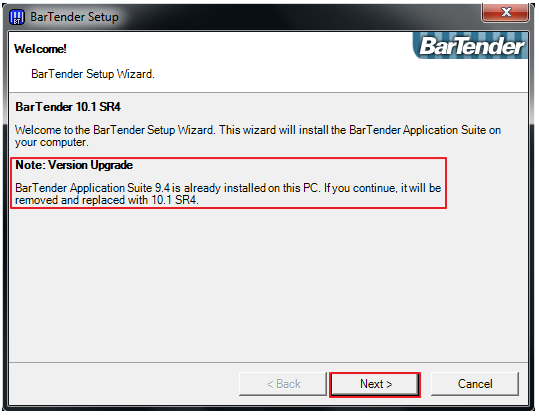 Download the version of the BarTender Suite you purchased and have it available on the Server or PC you will be performing the upgrade on. Note: The email you received with your upgraded Product Key Code should also include a download link for the new software version. Download the installer for your version. Click "Other versions and options" then choose your version from the dropdown list. Note that our site does not work with Internet Explorer. Once the BarTender download has completed run the download. Select the Language for the installation from the drop-down list. 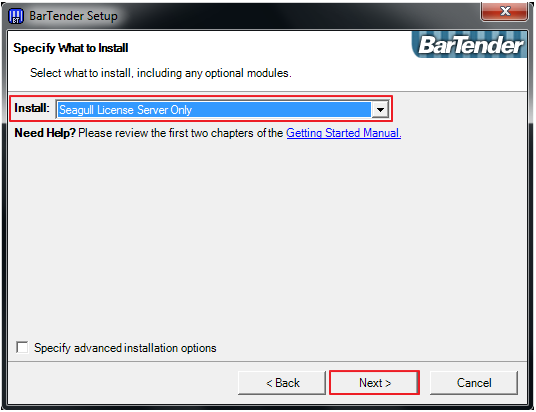 Select the correct Edition of the BarTender Software Suite you have purchased. Note: The email with your upgraded Product Key Code should include the Edition of the BarTender Suite you have purchased. In the next window select the drop-down list to select what to install. Select "Seagull License Server Only". Once the installation has finish you will be prompted to activate. Enter the Product Key Code provided in your email. Read the Activation Policy and check the box “I Agree” in order to proceed. Select the Country where the Seagull License Server will be activated. The next window will advise you about having a working internet connection. You should have now completed your activation of the Seagull License Server. You should now be looking at the BarTender Setup window again. Optional (but encouraged): Register your new license by selecting “Register Online Now”. After registration is complete return to the BarTender Setup. Installation and Activation should now have been successful. In the steps below make sure to select: Seagull License Server, NOT Seagull License Server Remote Administrator. If you do not have a start menu, search installed programs for “Seagull License Server”. When the Seagull License Server application is launched it will tell you the License Server needs to be started. Click "Start Seagull License Server Now". You may close the Seagull License Server as it should now be running as a Windows System Service. Your Seagull License Server has now been successfully upgraded, activated, and started.